She was shy that day. 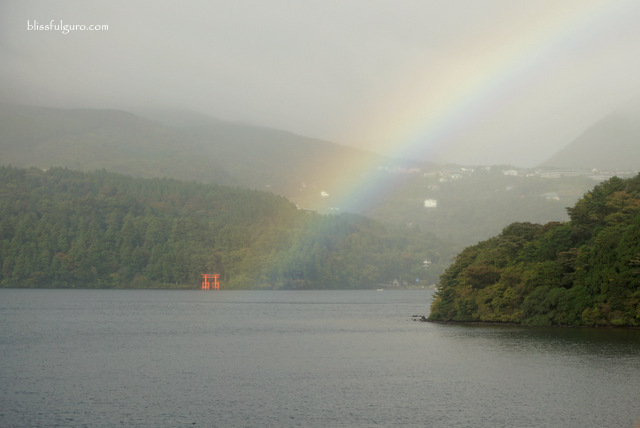 Blanketed in thick clouds, we covered almost every spot in Hakone to have a glimpse of her grandeur. And yes, we saw her, but not the fullness of her. Mt. Fuji was timid that day as she only showed her base to us. We didn't get to see the highest mountain in Japan but we were satisfied—we're happy for that sneak peek. It was my first autumn trip that was spearheaded by a friend. He found a great deal on a roundtrip Manila to Tokyo flight which he booked right away, without me knowing it. I didn't have any inclinations on highly urbanized cities before as I find those cold and lifeless just like my first visit to Singapore. But that changed, eventually. Getting a Japan Tourist Visa is fast and easy as long as you have all the requirements needed. You may want to check out my Guide on Japan Tourist Visa Application for Philippine Passport Holders for a detailed review on my visa application. Having been to Seoul early this year for my first ever winter trip, I was excited to finally get a taste of autumn in my first trip to Japan with my best buddies. It wasn’t the peak of the season but we got to experience the chilly weather and the shifting of nature colors. We don't usually have fixed itineraries on our trips and would just heavily rely on our gutfeel. But for this particular trip, we sought the help of the ever-reliable Klook App for great deals on activities, transportation and connectivity because it’s fast, hassle-free and reliable. Check out my Tokyo Travel Guide for First-Timers for more tips. I was tasked to check the options for our Hakone day trip. 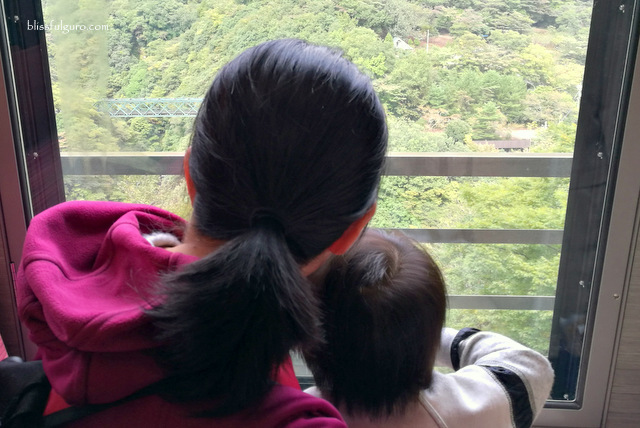 We could've opted for a guided shared tour but chose the Hakone Free Pass because we love to wander around on our own and, as I mentioned earlier, our moods normally dictate the flow of our daily activities. We left our home in Tokyo, Wired Hotel Asakusa, at around seven in the morning and headed towards Tokyo Metro's Shinjuku Station. In there, we exchanged our Klook voucher with physical Hakone Free Pass tickets at Odakyu Sightseeing Service Center. The queue was long but we proceeded directly to the counter dedicated for Klook and got hold of our passes in no time. With an Unlimited Hakone Pass, you could choose from a two-day or three-day passes which will allow you to have unlimited trips on eight different types of transportation in Hakone, including Hakone Tozan Train, Hakone Tozan Bus, Hakone Tozan Cable Car, Hakone Ropeway, and Hakone Sightseeing Cruise. You could also get discounts to over 50 establishments around the area including hot spring resorts and souvenir shops using the same pass. 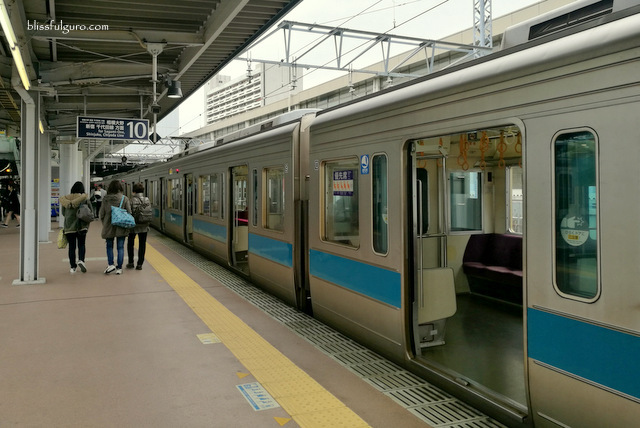 The Hakone Pass also includes a roundtrip train ride from downtown Tokyo so we didn’t have a hard time going to Hakone. The local train wasn’t packed that day. We were going to Odawara in Kanagawa Prefecture and the early morning cityscape swiftly changed into countryside views as we traveled. The mountains were heavily blanketed with old-growth forest that was speckled with morning dew. 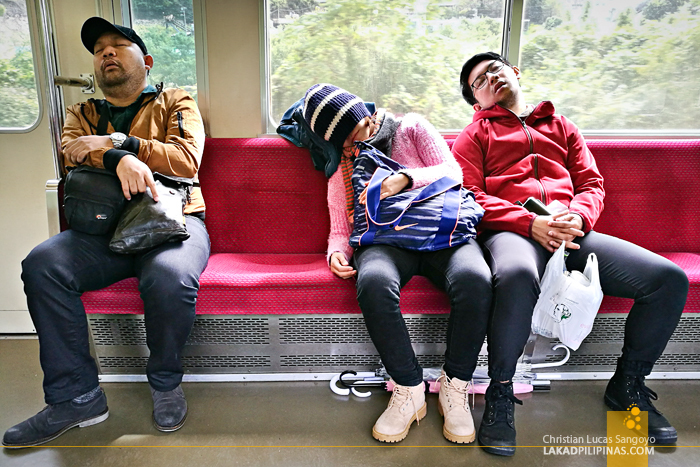 The moving train lulled us to sleep that in just twenty minutes after we left downtown Tokyo, everything went blurred. I was awoken with the sound of rushing passengers. My buddies were all dead to the world and we would still be in dreamland and probably would have gotten off far away from our supposed train stop if I didn’t wake up. We reached Odawara around noontime. The weather was in a crazy mood swing—it will be drizzling non-stop for a minute and then a ray of sun will pierce through the thick clouds on the next. The weather wasn’t helping at all as we battle with the chill every time we went out—the struggles of tropical creatures. Right at the train station, we transferred to another line where we waited for the Hakone Tozan Train. We were at the ridge of a mountain and the view from inside was amazing. The ride was fun as we got to see the thick foliage that covered the mountainous area of Hakone. After a leisurely train ride, we got off on another station where we queued for another ride (skipping the long line on the ticketing booth). The view from Tozan train. 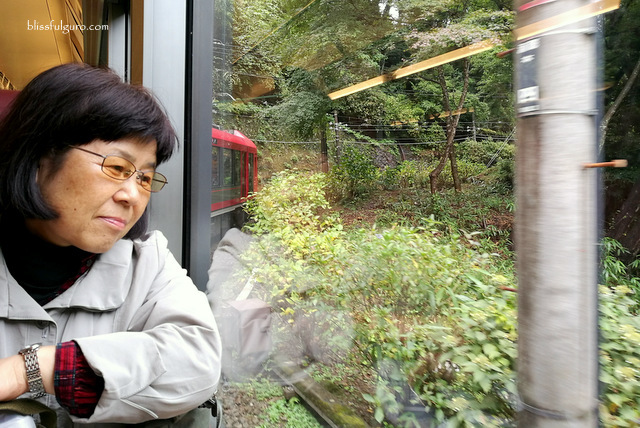 It was another train ride but this time, we were passing through a sloped hill. 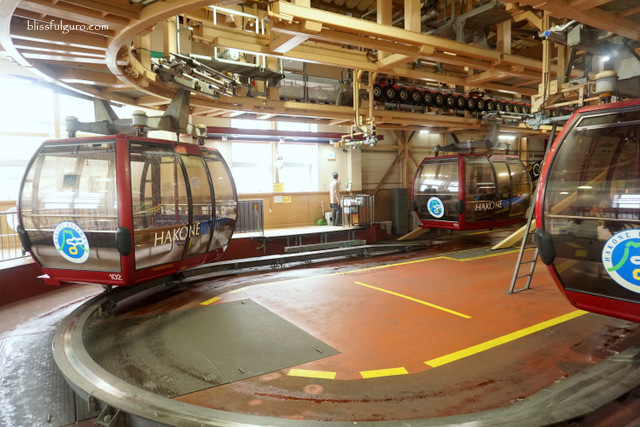 We got off somewhere in the middle along the ride to go for our next adventure, the Hakone Ropeway. Mt. Fuji was still not in sight as we enjoyed the view on board the Hakone Ropeway. Thick early autumn foliage in red, yellow and orange hues covered the foggy mountainous area. It was drizzling at times which made it more romantic. The terminus for the Hakone Ropeway is also the point of departure for the Hakone Sightseeing Cruise—very efficient and well-organized. 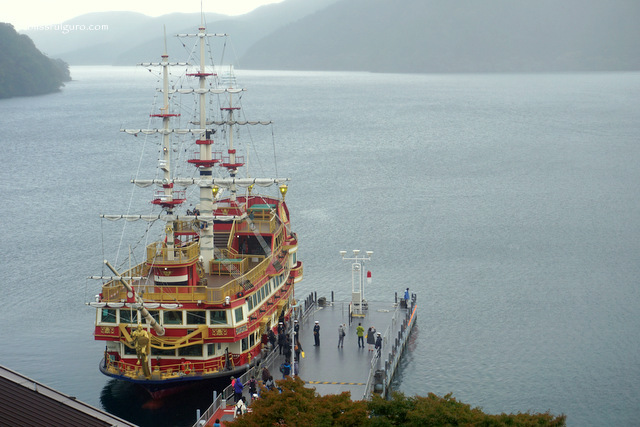 Using our Hakone Pass, we, once again, skipped the long queue at the ticket booth and proceeded directly to the docking port. 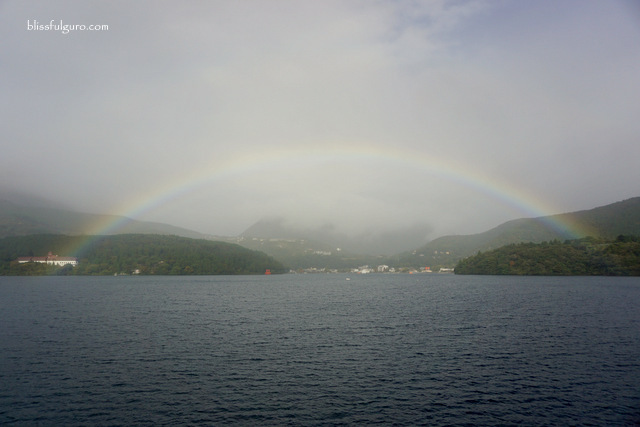 We hopped on the cruise ship and the voyage commenced along Lake Ashi. I was reminiscing my adventures on board SuperStar Gemini and our Halong Bay Overnight Cruise. We examined first each and every level of the ship using the lift and finally settled on top deck. The sun finally showed up. After three days in rainy Tokyo, we finally saw the glimmering sunshine. And then finally, we saw her. Mt. Fuji was a bit shy that day but shew showed off her base. A full rainbow arched just in time for this fleeting moment. After the cruise, we had lunch on a restaurant overlooking Lake Ashi (I will dedicate a separate post on our amazing Japan food trip). We went back to Odawara train station aboard the Hakone Tozan Bus. We hopped on the local train and shared some anecdotes from this quick side trip. And as if on cue, the four of us went back to dreamland and woke up, yet again, to the sound of rushing passengers. We’re back in downtown Tokyo. 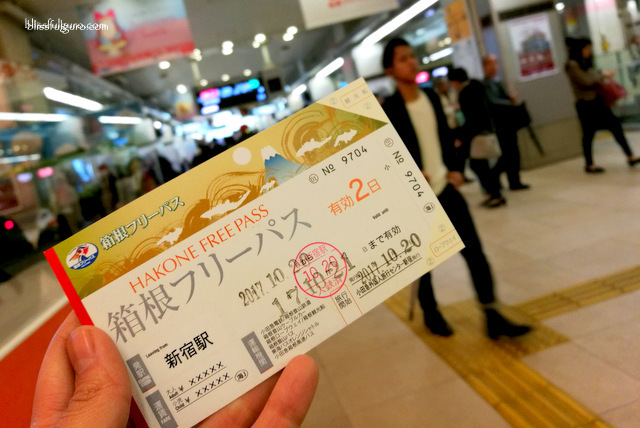 We surrendered the Hakone Pass when we got back to Shinjuku Station. We could’ve stayed for a night in Hakone to fully utilize our Two-Day Pass but our limited time prevented us to do so. It was a fun day trip though as we took our chance to see the splendor of Mt. Fuji. It might be a failure on our first try but it’s more than a reason to go back to Japan. 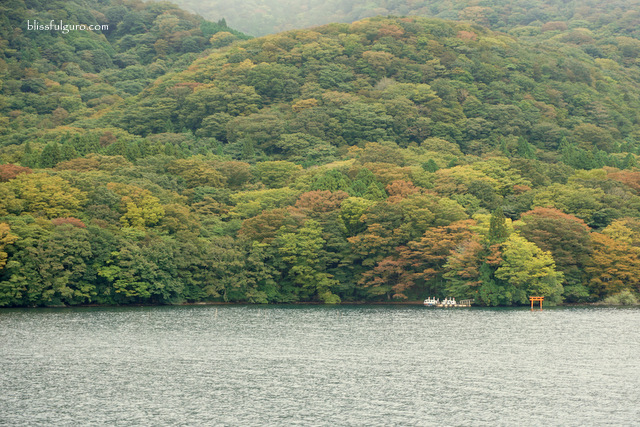 Check here for discounted accommodations in Hakone.